After seeing many voices on the internet reviewing, reacting to, and discussing the highly anticipated Batman v Superman, I thought it was about time to put my thoughts down. Batman v Superman is a highly problematic and flawed film in many ways. It packs about five films into 2 hours and 30 minutes, without any stitching of them together. It also does LOTS of groundwork for the DC Extended Universe to prepare for next year’s Justice League Part One. Out of all the chaos, though, a genuinely entertaining film arises, and for the most part I enjoyed it despite the many flaws. It is a weaker film than Man of Steel, but whereas Man of Steel had a cohesive narrative and essentially misunderstood Superman, Batman v Superman has a tighter – if not entirely accurate – grip on what makes it’s lead characters appealing. Don’t misunderstand me, Zack Snyder still misunderstands Superman on the most basic human level, but he takes much more of a background role compared to Ben Affleck’s Batman. Without a doubt, Ben Affleck is now the definitive Batman. He strikes the perfect balance between Bruce Wayne and Batman, something few of the previous actors have been able to do. This is a Batman ripped straight from the comic-books, even if Snyder still misses the characterisation slightly (his obsession with superheroes killing their enemies is a genuine detriment to this universe). Batman v Superman is an improvement over Man of Steel in this respect – as Superman isn’t in this film too much, I felt much more comfortable with what was happening and with the flow of narrative. However, Snyder really hasn’t cracked Superman, and that’s a genuine shame, because their confrontation lacks a dramatic weight as these characters are just too similar. It’s a shame, as Henry Cavill is a great choice to play Superman. He just needs better scripts and better direction, and a writer who understands the essential aspects of Superman. Maybe Max Landis? Snyder seems much more interested in the idea of Superman and the political / sociological implications of such a character, than the actual character of Clark Kent himself. This is dissapointing because Superman is easily one of the best characters in superhero comics when written well. Further complicating Snyder’s portrait of Superman in this film is the fact that, yes, he’s interested in these implications of the character, but he NEVER answers these questions of what a world with Superman would look like. Apparently posing these questions semi-intellectually is enough for him. It gives some thoughts to chew on but the lack of a thematic conclusion to what Superman means politically / sociologically would’ve given a deeper picture to a flawed depiction of Superman. Actually, I guess it does thematically conclude – Superman doesn’t mean anything politically / sociologically in a world where Batman exists, because Batman is better. Or something like that. Gal Gadot’s Wonder Woman, like Ben Affleck’s Batman, looks really good. She’s not in the film too much, and basically serves as a plot device to complicate Batman’s story arc, and turns up at the end for the inevitable final battle in the third act. She is very much shoe-horned into the film and serves no real purpose narratively, but saying that, Gal Gadot imbues so much personality and character into Wonder Woman. It makes me really excited to see the eventual Wonder Woman film. Unfortunately, whilst the first 2 hours of this film are exciting and mildly thrilling, it kind of falls apart in the third act. Zack Snyder’s need for a city-destroying third act leads him to shoehorn in the worst of all Superman villains, Doomsday, and have a mess of a final battle that I couldn’t really follow. It of course ends with Superman’ death, the most (only?) heroic thing he has done in the film. What pissed me off about this ending is I don’t think the DC Universe has earned it yet. Two films in, and we already have the major icon of this universe dying before a seeming resurrection at the end? It felt unearned, and maddeningly denied a future filmmaker from doing justice to a sorta-good 90s comic that is popular for reasons I can’t comprehend. Had Snyder instead focused his energy on creating an interesting Luthor maybe this finale wouldn’t have been necessary. I would’ve much rather had Batman and Superman team up at the end to stop a nefarious plan by Luthor to blacken Superman’s name, but I guess that’s maybe a bit too much to ask. This review has sounded largely negative so far, but I did actually really enjoy this film. I think after Man of Steel I was largely apathetic to any DC Universe film that hit the cinemas, but the pacing and intensity of the filmmaking kept me intrigued at all times, even if the film didn’t pay up on that intrigue at the end. It’s a frustrating film, like Man of Steel, because it does a lot of great stuff but also gets a lot wrong, filmmaking wise. 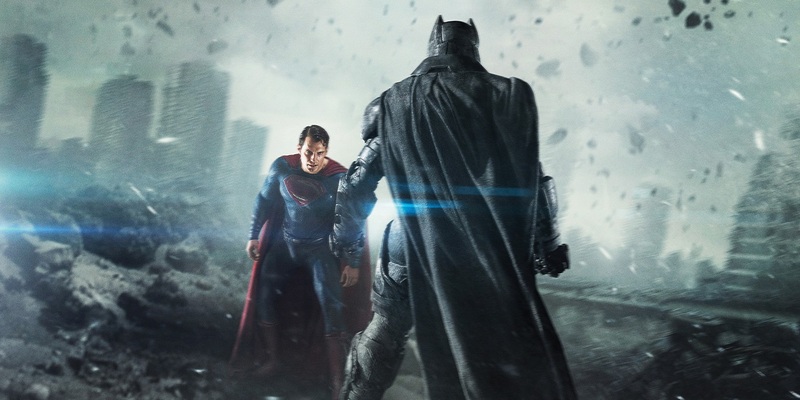 Batman v Superman could have used another few months of screenwriting time. In my opinion, they should have entirely dropped the third act, cut out Wonder Woman, and made this film solely about setting up the relationship between Batman and Superman, with Luthor as the villain. I think it would have strengthened the film and made it the first great film in this new wave of DC pictures. As it is, though, Batman v Superman is worthy popcorn entertainment, as long as you don’t try to think too hard about what it’s failing to say.